Whatever notoriety Rage has as a novel is because a) Stephen King wrote it, and b) Stephen King has forbidden any future printings of this novel. The reason has nothing to do with any quality the novel possesses. Rather, it has everything to do with King requesting no more future printings of Rage. This may seem like an odd thing for an author to do, even one as successful as Stephen King, but the reason is simple: Rage is a novel which prominently features a high school student shooting several of his teachers. Rage was linked to several school shootings, copies appearing in the lockers of several shooters and one of the kids involved quoted from the book during one of the shootings. This was not a link which King wanted or needed. While there could have been a financial aspect to King's decision, I suspect it was more of a moral one. This is just a guess, but why would Stephen King want one of his novels linked in any way to this sort of crime? Why should that novel remain in print? King has no culpability in the shootings, even should a kid claim the novel as inspiration, but there is no reason to have that connection. In the United States Rage is currently only available in an omnibus edition of four of King's Richard Bachman novels. Also included are The Long Walk, Roadwork, and The Running Man. As noted Rage is a Richard Bachman novel. 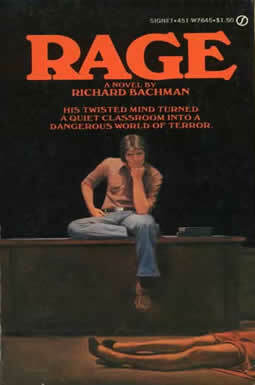 Bachman is Stephen King, but Rage was originally published by the pseudonym. Call it a publishing experiment. Can Stephen King’s work achieve the same success he did with Carrie? The answer ended up being a resounding no. The Bachman novels sold around 28,000 copies each. When published later under King's own name they sold millions. When it was written before Carrie (King's first published novel) Rage was titled Getting It On. The original title stinks, so it is probably a good thing the title was changed. It is difficult to say if this is the first novel Stephen King attempted to write, but it definitely shows that Rage is an early novel. It is very rough, especially in the early chapters before the story really gets going. Charlie is a boy without too many friends and who has trouble with authority. So, he brings several guns to school, walks into a classroom, shoots the teacher, and holds the classroom as hostage. So begins the real story of Rage: Charlie in the classroom. Will the police get him before he kills more people? Will any more students die? There is a line of tension running through the novel because Charlie was obviously messed up enough to kill. Is he messed up enough to do it again? As a concept Rage is interesting enough. I imagine if Stephen King would write the novel today he would write a very different and much stronger novel. But Rage is an early work by Stephen King, maybe even his first attempted novel. It is not very good. If anybody else wrote Rage it would have long gone out of print before King took it out of circulation. The dialogue and narration is choppy, the talk about "getting it on" feels forced, and Rage just feels like a first attempt at a novel and not really a strong professional work like Carrie was, and later Salem's Lot. Notable only because of the novel's history, Rage cannot be recommended as a work of fiction. For completists only.